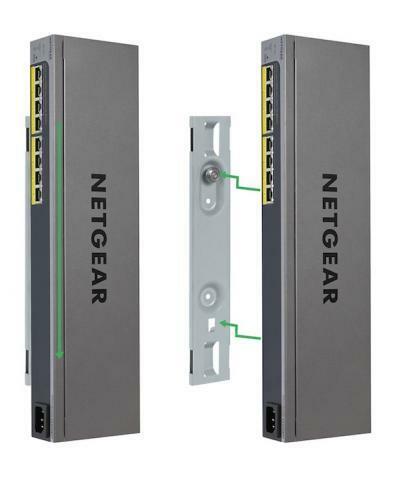 Two new NETGEAR, Inc., Power-Over-Ethernet (PoE) switches feature a novel "Virtually Anywhere" mounting system that delivers modern high-power PoE+ to devices that others cannot. The mounting system on the two models—the ProSAFE 8-port Gigabit Ethernet Web Managed PoE+ Click Switch (GSS108EPP) and the ProSAFE Easy-Mount 8-port Gigabit Ethernet PoE+ Web Managed Switch (GS408EPP)—offers ultimate flexibility in placement so that PoE+ ports are available exactly where needed to power WAPs, VoIP phones, IP surveillance cameras and IoT devices. In any orientation, they can be mounted on a wall, strapped to a pole or tucked under a desk or tabletop. In addition, the GS408EPP's unique design allows for two switches to be mounted in a single 1U rack slot, saving valuable rack space while allowing for future expansion. Both switches also provide configurable, advanced Layer 2 network features.